President Carter was in the news last week, announcing his diagnosis of brain cancer. I’ve struggled with how to address this sad news. Carter’s whole life has been inspiring. Less than a week after his announcement and cancer treatment, Carter was in church teaching Sunday school for the 689th time. We saw Carter teach Sunday school several years ago. Just last month, we took our daughter to meet him. He is an inspiring Christian and humanitarian. 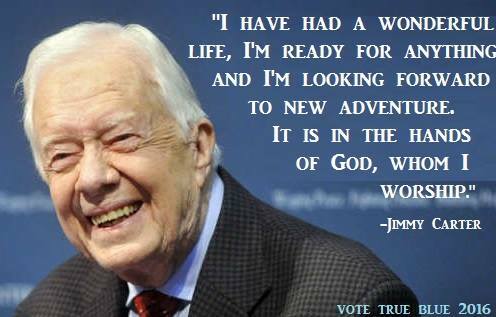 Would that we could all be Jimmy Carter Christians. This entry was posted in in the news, Uncategorized and tagged Baptist, Christian, Jimmy Carter, Jimmy Carter cancer, President Carter. Bookmark the permalink. You were and are a great President, and this office needs to be respected. How do we stop Donald Trump. Any advice. I know the USA and it’s people will come through. Thank Mr President.